Melyssa is using Smore newsletters to spread the word online. Thank you for your business in December!! If you earned Dot Dollars during the month of December by spending $50 or more at a trunk show or online, tomorrow is an exciting day for you! It's time to treat YOURSELF to some sparkle!! 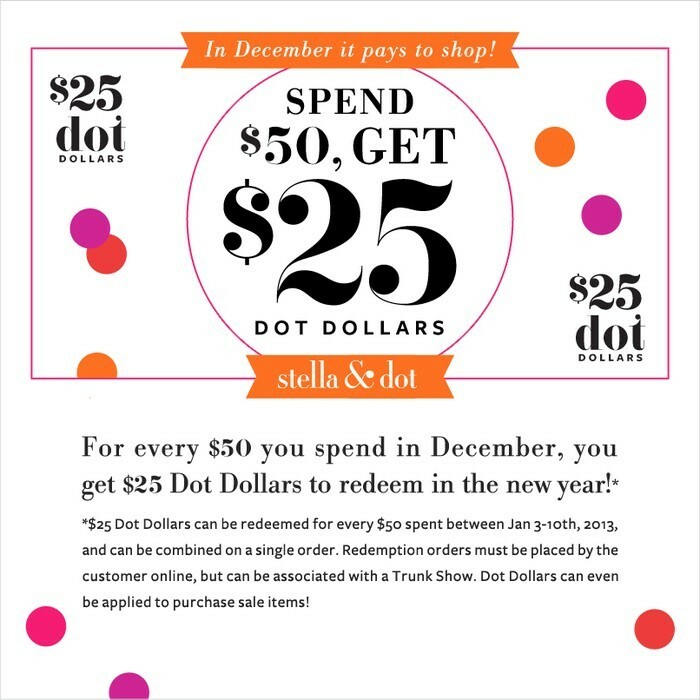 During the month of December, you earned $25 Dot Dollars for every $50 spent with Stella & Dot. 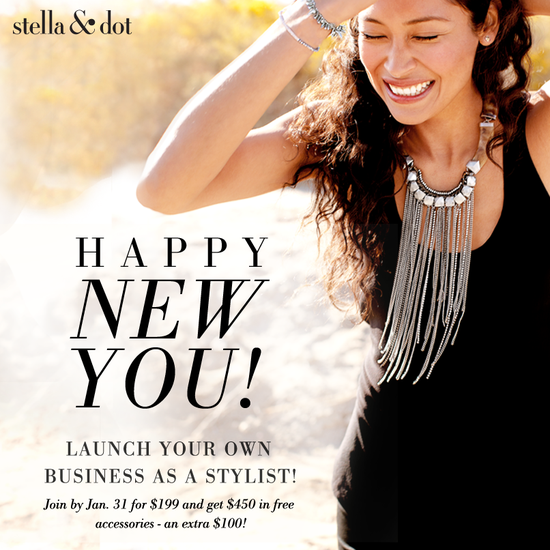 You can use your Dot Dollars any day at anytime (www.stelladot.com/melyssa) between January 3rd-10th. For each $50 you spend, you can apply your $25Dot Dollars certificate to your order! Tomorrow, January 3rd, you will receive and email that will include a redemption code that you will apply to your order at checkout. For every $25 Dot Dollars you earned you will receive one promocode. You will have one week (until January 10th) to redeem your dollars, so go ahead and treat yourself to a fabulous gift! Prior to this event it would be helpful if you have not already done so, to set up your online account. This can be done by going to: www.stelladot.com/melyssa click on log in, enter the email you provided me with upon placing your first order, and then click on need your password. You will be sent a link to set up your account. After you have spent your Dot Dollars, take advantage of the TRUNK SHOW EXCLUSIVES! When Trunk Show guests spend $50, they can receive these items at 50% off! Be a Hostess and YOU will be rewarded! 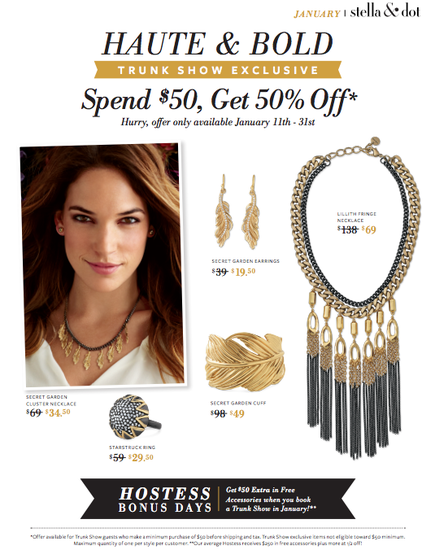 Host a Trunk Show in January and you will earn an additional $50 in hostess credits! Email me (mcnunnari@gmail.com) if you want to host a Girls Night Out on January 12th, 13th, 18th, 19th or 20th. Last May, I decided to become a stella & dot stylist and I couldn't be happier with my decision. I have met the most inspiring and driving group of women and enjoy every minute I spend on my business with stella & dot. Receive $100 in FREE product! 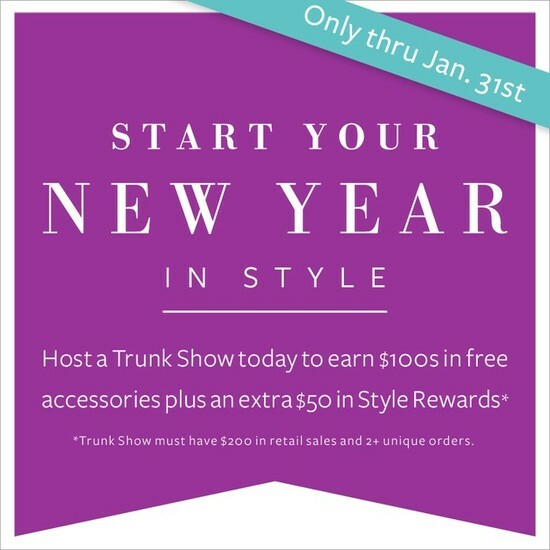 All new Stylists who sign up between 1/1 – 1/31 will automatically receive an additional $100 in free sample credit!